NU'EST Confirm Appearance at KCON New York and Unveil New Teasers for "Happily Ever After"
On Saturday night, the K-pop superstars performed one song from 2017, “Mic Drop,” and one tune off their latest album, “Boy with Luv”—co-written by Fontana, a veteran whose résumé includes work for acts like Britney Spears, the Chainsmokers, and Justin Bieber. Her first song for BTS was “Euphoria,” which wound up being the lead single on their 2018 album Love Yourself: Answer; Fontana later contributed two tracks to this year’s Map of the Soul: Persona. Fontana’s BTS compositions are written in English before being converted into Korean. But despite the language barrier, she found herself forming a connection with the band’s members when she met them for the first time while rehearsing for S.N.L. “Jungkook was looking at me kind of sideways, and RM looks at me kind of sideways—and Jungkook just covers his mouth and whispers to __J-Hope . . . __ And RM was like, ‘The songwriter!’” Fontana said. Soon enough, they had enveloped her in a group hug: “It was like one of those awesome slow-motion movies, running toward one another, and we had a moment.” The group sat on the edge of the stage as the S.N.L. crew set up—talking about the Music Modernization Act, their sorry sleep schedules, and why they got into music in the first place. The performance itself was a tricky technical prospect. For “Boy with Luv”—a track Fontana interprets as a callback to their 2014 song “Boy in Luv”—the group used familiar choreography from their music video . . . or tried to, although the S.N.L. stage was a little more cramped than the spaces they’re used to. According to Fontana, group members bumped into each other occasionally as they practiced—though that did not happen often. They were assisted by a last-minute addition to the studio: S.N.L. “brought in a dance floor—like, they actually re-floored the stage on show night,” Fontana said. The new floor, she explained, was smoother, allowing the group to execute specific moves that require sliding on their feet. Even in rehearsal, Fontana said, the men in BTS are precise dancers: “It still looked better than any dancer I’ve ever seen in my life. They’re just so tight!” They kept their focus, even when surrounded by a horde of security guards, who patrolled every possible point of entry in their midtown rehearsal space—a necessary evil for a group that inspires passionate fan activity wherever it goes. On the day of the show, the group ran through their numbers twice, performing a sound check and a fully-dressed rehearsal for the studio audience. “I would say we went over the songs 10 to 15 times before we actually performed it live,” Fontana said. 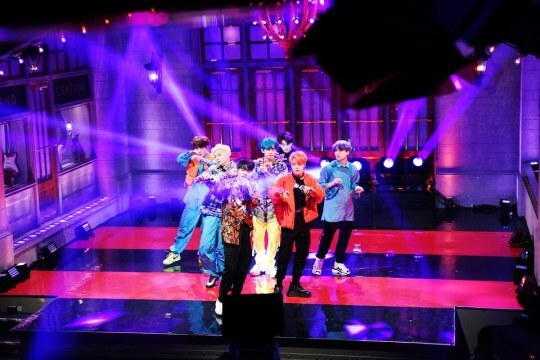 I read that article earlier today and I lost it at SNL changing the floor for them last minute. The impact! Tbh if my mom did something cool like this before I was born and said something like "I don't even think having kids could top this" or something like that, I would think it was funny and cute. It's really cool they changed the floor. Damn I didn’t know they changed the floor last minute. Kudos to SNL. Girl was on cloud 9 that day, good for her. It’s always nice to read/hear how nice and respectful bts is backstage. "men in BTS" Even tho they are men, it's so weird when they are called that cause everyone calls them 'boys', I mean, I guess it doesn't help that's in their original name. Ok i know it's some kind of historic moment etc but the rating for their episode is low? I've never watched SNL but I'm confused about this fact. Will i supposed to think that, "apparently general American audience didn't really care about BTS" or "even BTS can't save the show" ? Because if I saw weeks prior to the airing, people were saying that SNL is the biggest show in the US and it is huge. But then after knowing its low rating people said that nobody watched Tvs nowadays and they'd prefer to just go to youtube to watch the performance, and that the skits were unfunny. Is it some kind of Army denial or was it true? As far as I know, ratings for this time of year are always low. And these days its only really interesting if something big's going on politically. The Meuller Investigation is over so there's not much to joke about on that front anymore. And people don't watch SNL for the musical guest anyway. They tune in for the host since musical guest aren't the focus of the sketches usually. So casual viewers will skip it if the host isn't someone they're interested in. So then that just leaves the SNL regular viewers. But even with the rating SNL was still the #1 show. So take that for what you will I guess. I see! Since it's still #1 show then the US audience are supposedly still enormous, I take a bit of relieve then. Anyway, i always felt Euphoria (and to some extent BWL) sounded very Eurovision like, hence why i cant get into them. and it turns out she worked on Eurovision songs before. As for the SNL ratings, yes, they were very low, but people were saying there were NBA play offs at the same time. This page was loaded Apr 23rd 2019, 2:13 pm GMT.